Red ants (Crematogaster spp.) get their name from their habit of acrobatically raising their abdomen above their head, especially when they are disturbed. When viewed from above, the abdomen is heart-shaped. There are several species of acrobat ants in the United States. Acrobat ants are small; most species are less than 5.4 mm in length. Many emit an unpleasant odor when disturbed. Outdoors, red ants nest near moisture such as under stones, in stumps, in rotting logs and under woodpiles. 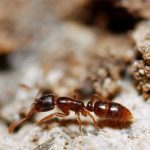 When they invade homes, red ants often nest in damp areas such as in foam sheathing behind siding, and they even have been found nesting in roofing near a leaking skylight. Red ants often nest in wood that termites or carpenter ants have damaged. It is common for red ants to clean out the galleries that other insects have made in the wood. They push the dirt or wood scraps out of the galleries. Sometimes homeowners find this debris and think there is an active termite infestation. Red ants normally eat insects and honeydew, a sugary waste excreted by sap-feeding insects like aphids. Red ants protect the aphids that produce the honeydew. If red ants come into a home, they usually prefer sweets and meat. The ClearZone Man can come periodically to monitor your premises and help prevent an infestation with RED ANTS. Thank you so much! It a amazing webpage!